Grenada’s Prime Minister, Dr the Rt Hon. Keith Mitchell, congratulates his counterpart, the re-elected Prime Minister of St Vincent and the Grenadines, Dr Ralph Gonsalves. Dr Gonsalves and his United Labour Party secured 8 seats to defeat the opposition New Democratic Party, which emerged with a total of 7 seats. Dr Gonsalves and Dr Mitchell, both veteran politicians, have worked together closely at the CARICOM level. Dr Gonsalves has been one of the leaders appointed by CARICOM to the Subcommittee on Cricket Governance that is chaired by Grenada’s Prime Minister, Dr Keith Mitchell. 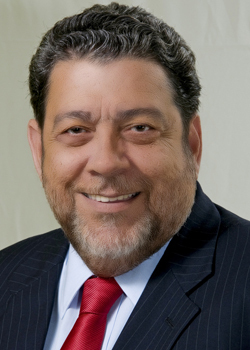 Member Governments of the Subcommittee recently met in Grenada, but Dr Gonsalves who was in the heat of his campaign at the time was unable to attend. For his part, Dr Mitchell says that he looks forward to continuing to work closely with Gonsalves on a number of issues in regional development, but especially on their charge of leading the reform of the Governance of West Indies Cricket, which they believe will go a long way in helping to restore the West Indies team to its former glory, and bring back the passion for the region’s number one pastime.